Until I had kids in school I never realized how many holidays and special occasions could be celebrated. Aside from the standard ones like Halloween and Valentine’s Day there’s also the 100th Day of School, President’s Day, and Football Fridays. And apparently tomorrow is Dr. Seuss’s birthday, which means it’s yet another day filled with fun themed activities including food of course! Plus who can resist bringing one of Dr. Seuss’s most legendary books to life…Green Eggs and Ham! No need to break out the nasty artificial green dye though, see below for a much more nutritious (and delicious) alternative. Eggs and kale make a surprisingly good combination and once you’re done you can check “eating your greens for the day” off your list. But whether you are a Dr. Seuss fan or not you can still enjoy this dish for breakfast (lunch or dinner). I promise it will taste just as good without the colorful toothpicks. :) Enjoy! Combine first 5 ingredients in a blender (including the S&P) and blend until the greens are pureed into little bits. Heat a big pat of butter (don’t be stingy!) in a frying pan over medium low heat. Once the butter has melted pour the egg mixture into the warm pan. Let it sit for a couple minutes before you begin to stir and scramble with a spatula. Cook until eggs are done all the way through. Can’t wait to try this, it looks delicious! Do you buy your butter from the farmer’s market or is there a specific brand you get from Earth Fare? Thanks for all the recipes and info, you’re awesome! I buy Organic Valley “pastured” butter from Earth Fare. 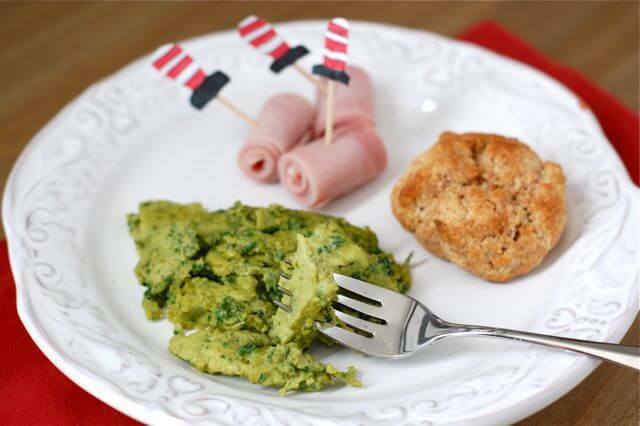 What a great idea for creating Green Eggs and Ham! If you put the eggs and greens and blend them together, the entire eggs come out green. My kids thought is was really cool!! I give my 20 month old green eggs a few times a week! Honestly he probably thinks that scrambled eggs are always green! I puree it really well because he’s going through a really picky stage right now and it’s better if there aren’t any pieces he can pick out. They’re yummy and it’s an easy way to get some greens in him! I have a bunch of kale in my crisper that I was wondering how to use (my previous at kale chips didn’t go over so well). This will be perfect! p.s. I’ve enjoyed following your website immensely. I can (almost) make your granola recipe from scratch. Thanks for all the hard work you put into your blog. I was wondering about the sugar content in ham and bacon. When I looked in the grocery store it seemed like they all had added sugar. Is there a brand that doesn’t? We oftentimes buy uncured ham from our local farmer’s market. The best storebrand I’ve seen (for both ham and bacon) is Applegate Farms organic. Love it! My son is allergic to eggs, so we did something similar with brown rice for him. We juiced Kale in our Omega juicer and used the green juice to color home made frosting for St. Patricks Day treats! EASY!!! We’re going to make this for dinner tomorrow night! green eggs are our friday night ‘fuss free’ speciality! my kids even request it when staying at their grandparents. such an awesome way to boost their intake of veggies, particularly spinach. Made my Dr. Seuss toothpicks, ham, green eggs and heart shaped toast this morning for my family. I loved it. My girls loved it. The “green” eggs, however, weren’t their favorite simply because of the green presentation. Oh well. It was a homerun in my book because my husband cleaned his plate! What a fun start to our day. Thank you for sharing all your great ideas. so clever! thank you! we just finished our breakfast. was a big hit! Packed this in my son’s lunch today. He was very excited about it. Thanks! You read my mind! I dropped my preschooler off this morning and learned that they were making green eggs and ham. Ick! My head was spinning-no food coloring please. What a great idea you have. Thanks for sharing. I made these this morning!! We used chopped kale and green onions in the eggs. (Very attractive color!) There was a dash of green Tobasco to add a little bit of flavor. This was served with organic nitrate free ham breakfast slices and heart shaped wheat free biscuits along with a dollop of raw milk butter. We had freshly made Thai tea to drink. YOU were my inspiration…..making fun memories for my children…..thank you, thank you! what a fun idea! i regularly use spinach in my eggs– and whatever leftover veggies we have on hand. i’m so used to throwing kale into soups, etc that for some reason I never considered tossing it into our scrambled eggs! thanks for this idea, and all of your wonderful posts. this is one of my favorite peer blogs to read. keep up the wonderful writing and inspiration! I love this!! I skipped green eggs this year since we just cut out all artificial color. I wish I read this yesterday! We will be sure to have a Suess day soon and give this a go. THANKS for all you do. This looks yummy! I almost skipped the green eggs too, but decided to make deviled eggs mixed with frozen spinach for lunch and they were a big hit. I made Green Eggs combining Pesto(I had made myself and frozen) Eggs and this recipe for kale eggs and it turned out great. Just made these eggs this morning! My one year old was getting sick of just regular scrambled eggs. He Loved these…he ate about half of the batch! But i did only use 4 eggs and reduced the rest of the ingredients a bit. Thank you so much for all you do for those of us who want to go to real food but didn’t know where to start. I am officially obsessed with your blog…thanks so much! Cannot believe it … just gave it to 4 kids who are the PICKIEST of PICKY eaters and they all ate seconds … and thirds … thank you. :) I can’t stop laughing, not sure why, think it’s what I do when I’m nervous and I was sure that none of them would like it … very relieved. I’ve been doing something similar for my son who loves green eggs! I put fresh spinach, feta cheese and eggs in my blender and then cook up an omelet. I was so disgusted when his school hosted a green eggs and ham breakfast and they had the grossest scrambled eggs with green food dye! Yuck! I love the idea of adding feta! We made these for dinner tonight along with your banana pancakes. Everything was great! Thanks! I’ve had green eggs in ham that use pesto for the green. Now that’s tasty. The kale would be more nutritious, but the pesto was super good too. and all you have to do is spoon pesto into eggs and scramble. This sounds delicious! I do something similar with spinach, but I will definitely try it with kale next time. The only thing I would suggest, is that you not add the eggs in until the other ingredients have been blended. Over mixing eggs causes them to be less fluffy and overall not have as nice a texture. I’d whizz up the other ingredients and then just mix the eggs for a few seconds. I made these this morning. My husband was skeptical at first, but he loved them! They were very tasty! You don’t taste the kale, or at least I didn’t. Thanks for providing a website with real recipes!! I am excited to try as my son has asked for green eggs and ham for his birthday breakfast. He is picky so I was doubly excited to read the recipe was well received by children :). Thank you for the healthy alternative ! thanks also for all your recipes and this blog overall. I absolutely love it. This looks like a great recipe idea! It sounds like a wonderful way to add veggies into food in the mornings. My husband and I often eat eggs for breakfast on weekday mornings, so I wanted to ask: can we blend a batch of this and then have it sitting in the fridge as an egg mix, that we can pour a bit of into a skillet every morning to cook with? Or does cracking the eggs cause them to start to go bad quickly? I didn’t know if this blend would last for a week in the fridge. Any advice would be greatly appreciated. Thanks! We made these for breakfast this morning. We cooked sausage with diced peppers and onions then added the green eggs. When it was done cooking we topped it all with parmesan cheese. All three of the kids, my husband, and I loved it. Jackpot. I knew there had to be a way! And this was just what I thought! Has anyone ever used a hand immersion blender for something like this? We are moving and our blender is packed up!! I really wanted to do this tonight…. I had to laugh at this! I make something similar: 8 eggs and several handsfull of spinach / kale salad mix, but I throw a few thin slices of nitrate-free ham or cooked nitrate-free bacon, a bit of Feta and some sautéed onion right into the blender too! I olive-oil-spray the 11″x9″ baking sheet that goes with my toaster oven, then pour this “glop” in and bake @ 350′ for 20 minutes. Then I cut it into squares that fit the homemade whole wheat biscuits, split-n-stuff the biscuits, Baggie and freeze. Voila: breakfast sandwiches for me for weeks! I put them all in a gallon Ziploc & toss it in the freezer @ work, then grab one on my way out the door after night shift. Keeps me out of McDonalds or 7-11 when I’m tired and willing to kill for an Egg McMuffin. And so far, the green has kept my coworkers from stealing them — their loss, eh? Try Amy’s recipe! Thank you so much for this recipe! Every other recipe I’ve checked uses food coloring. I replaced the kale with spinach and the eggs came out nicely green.